So what do we do exactly? Simply put, we transform outdoor spaces, both in the UK and abroad. Through design or creative maintenance, our work is characterised by a signature playfulness which wears Dan's knowledge of plants and materials lightly. Dan works to weave the separate strands of clients' personalities, architectural context and aspirations for future use together into a dream garden that is timeless and designed for the long term. Every new project brings exciting opportunities, we have never made two gardens alike. We have designed over one hundred gardens so far, so are well-versed in guiding you through the process every step of the way. Drop us a line at the bottom of the page and let's see how we can help transform your outdoor spaces. Alongside our design studio, we also offer a tailored creative maintenance service to develop your outdoor spaces, keeping them healthy and verdant! Dan's RHS training, natural eye and wide horticultural experience give him the edge in making sure your garden thrives! Get in touch below for further details. Daniel grew up in a horticultural household in Sudan and on Anglesey, North Wales, with parents holding Kew diploma and Landscape Design qualifications, and had learned all the plants in the hedgerow by a young age. 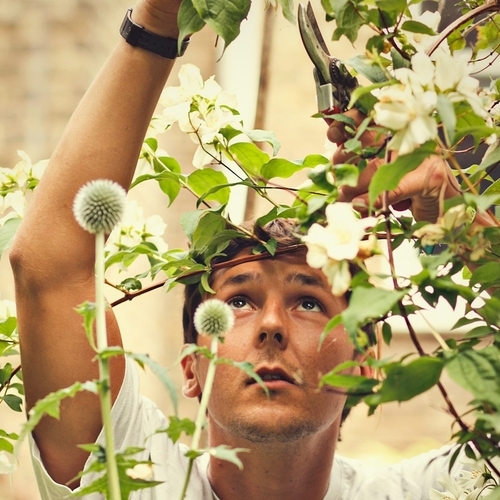 Drawing on prior training in fine art and graphic design Daniel started his own garden design business in 2008 and went on to study horticulture at Capel Manor College in 2009. He has designed gardens in London, over the UK and internationally. His never-ending quest to learn of new plants and experience them in their natural habitats has seen him journey on numerous plant-hunting trips worldwide, including Japan, SW China (2007), Peruvian/Bolivian Andes (2009), Tyrolean Alps (2009), India (2010), Langtang, Nepal (2011), Sri Lanka (2012), Taiwan (2013), Colombia (2014).